mood as I contemplate so many things. I am thinking about the future of our country. I am thinking about the future of horticulture as I am preparing a talk to celebrate the 40th anniversary of the CT Master Gardener’s Association. I am thinking about the weather and the frustration that I and my staff feel as we endure rainy weekends and rainy workdays. We are trying to get things done here! I work with such tough, resilient folks and I am so proud of them. I am pensive about my own yard and all the things I am still hoping to accomplish in the few Sunday afternoons I have left before Thanksgiving (that would be two exactly!) I have more perennials and shrubs to get in the ground, I haven’t planted a single bulb nor have I planted my garlic crop. 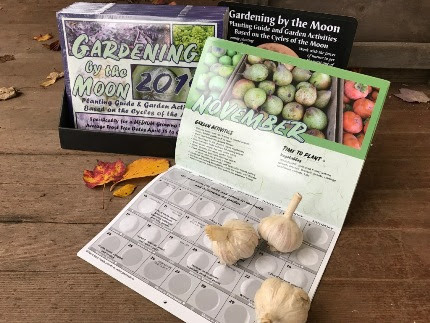 Gardening by the Moon states the best time to plant garlic is mid-November. We have 2 baskets of Russian Red seed garlic in the shop. Russian Red is our favorite so Diane ordered extra for the later garlic planters. Pick yours up soon! NO, it is NOT too late. 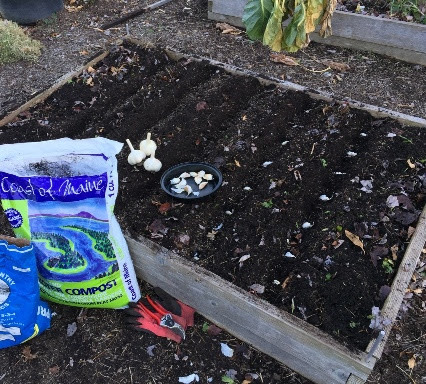 November is the ideal time to plant our organic, hardneck, seed garlic. We have ‘Russian Red’ in stock-get yours today before we sell out. Topdress beds with lobster compost and feed with Coast of Maine Stonington fertilizer or Pro Gro at planting time. morning workshop, I will be placing dozens of plants throughout our demonstration gardens for my crew to plant. Fall is when WE have the time to do this work and every spring we are so glad that we did. Diane has stated that Sunday, November 11th, is the LAST DAY the leftover plants will be available at half price. She has even filled one bench with plants at LESS than half price, I have affectionately named our Ridiculous Bargain Bench. We still have some perennial mums, tons of asters, lots of natives such as pussywillow, buttonbush, and elderberry shrubs, cool perennials such as Ligularia ‘Little Rocket’ and Monarda punctata, quite a few very hardy varieties if hydrangeas, Heucherella ‘Sweet Tea’, Heuchera villosa ‘Autumn Bride’, Vernonia ‘Iron Butterfly’, and more. We need to make room for greens and get our nursery yard ready for our fresh cut Christmas trees. The first greens arrive in a week, the first shipment of trees will be here before Thanksgiving weekend. That, my friends, is two weeks from this Saturday! If you buy a potting caddy, repotting your plants will never be a chore. We LOVE ours and use it every day. THIS Saturday morning at 10 am I am offering a very informative workshop on growing indoor plants. You need to register in advance, and the cost is a mere $5 but, when the class is over, you will get a $5 gift card good on any houseplants in stock! 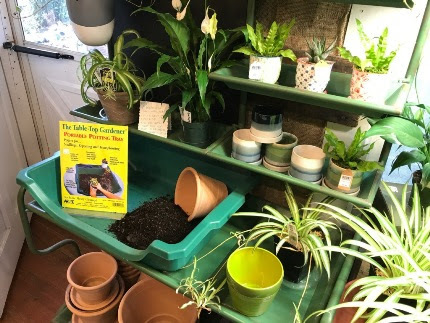 I will go through all the basics such as repotting, watering, organic feeding, humidity trays, light levels, organic pest control, and much more. Above you will see the coolest tool in our houseplant toolbox- our POTTING CADDY! I have one at home, and we have many in use at the shop. I wouldn’t be without it, it makes repotting simple to do anytime. We also have a good selection of terra cotta pots and saucers. These are my favorite because they allow oxygen to flow into the root system. 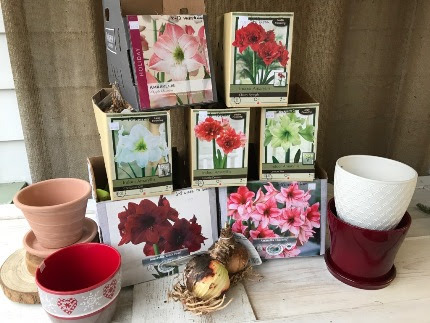 This Thursday at 4 pm on Facebook Live I will be demonstrating how to pot up and force our giant Amaryllis bulbs. Look at the great selection of colors, including my favorite ‘Black Pearl’ and a really unusual lime green variety. 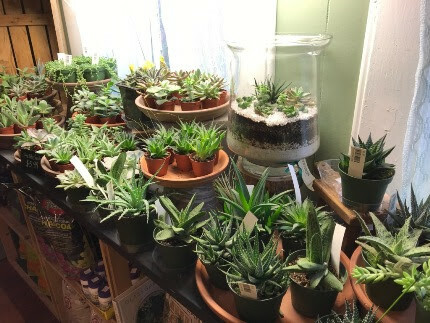 We have been restocking our succulent collection as well. We are making succulent pumpkins and using succulents in our fall and Thanksgiving arrangements. We also love to pot up succulent gardens for our customers. Think of Natureworks for unique gifts when you are heading to a party or going to someone’s house for dinner. Next week on Wednesday, November 14th we are taking the show on the road to the fabulous new home of Perk on Main in Middletown! Read the details below and join us for a crepe and coffee as we open a “pop up shop” for the afternoon! We will have a preview of some of our gifts and plants for sale. As we continue to transition to the holiday season, we are trying to make room on every front. Starting this week, all bagged mulch in stock is 30% off. We have Fragrant Forest and a small amount of cedar. We are also putting our grass seed on sale at 20% off. Have you ever done DORMANT SEEDING? This is a great way to get a jump on spring. Put grass seed down in November and it will remain dormant until very early spring when it will magically sprout the minute the snow melts and the sun shines on the earth. Scratch in a layer of Coast of Maine compost as you are scratching in the grass seed. If we continue with the rain and temps in the 50’s and 60’s, the seed will most likely germinate THIS year and you will be on your way to a nicer lawn for 2019. Remember, the best defense against weeds is a bag of grass seed! A custom Thanksgiving centerpiece- we make them in all shapes and sizes. Check the Calendar of Events below- Leslie will be teaching a Harvest Floral Design Workshop this coming Sunday. 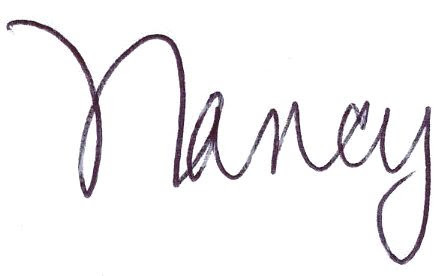 Register ahead, this will fill up fast. 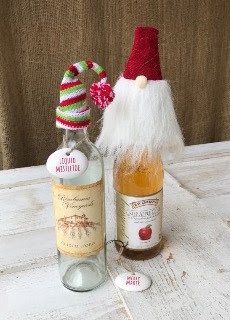 Don’t just bring wine as a hostess gift, add a bottle topper! more fun to give. 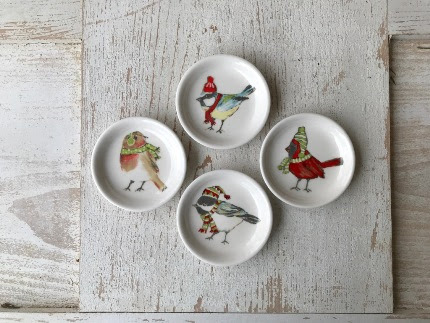 I love the plate that says “All I want for Christmas is food”- so many customers laugh out loud when they see it. I even have to admit that I have been eyeing the macrame star ornaments as my tree features stars and snowflakes of every kind. Macrame? It’s back! We not only have macrame plant hangers, we have snowman wall hangers and ornaments too. Who could have imagined that the favorite craft of my younger years would be embraced by this generation. Santa Claus is coming to Natureworks on Small Business Saturday, November 24th, from 10 am until 2 pm. Starting Thanksgiving week, I will be harvesting fresh greenery and bringing it into Natureworks constantly. Berries and colorful twigs too. season! This will be our 35th holiday season at Natureworks. The Friday after Thanksgiving is also a celebration that we call GREEN FRIDAY. I hate the name Black Friday and I hate the insanity that goes along with it. At this point, I am not sure it even means anything as “Black Friday” specials are already starting. What??? So we call it Green Fridaybecause we are a green organic business AND it is the start of our season of fresh greenery. 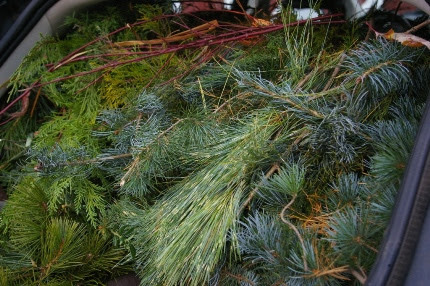 I harvest tons of unusual evergreens in my own back yard with the help of my landscape crew. 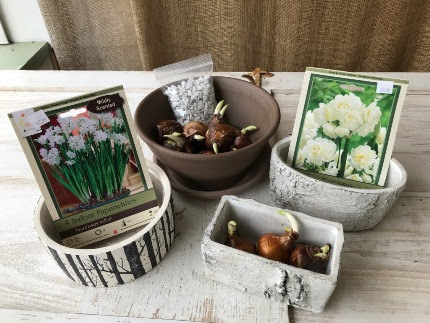 Start planting your paperwhite narcissus bulbs now- they take 3 weeks so you can stagger them to bloom in succession through the winter. Look at the unique containers we have! Those are faux birch ceramic pots with waterproof liners. 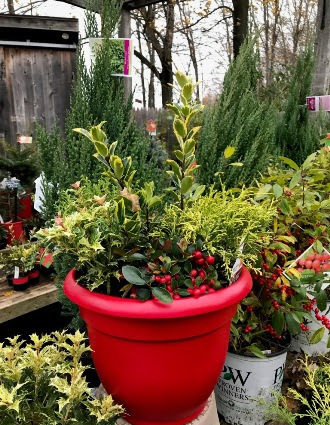 Check out our holiday plants and change out your pots before the soil freezes. 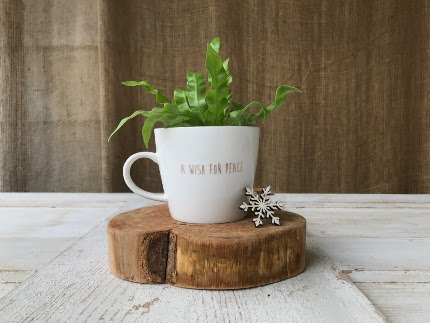 We have many mini evergreens to choose from! Evergreen trees too! Next year, plant them in your garden. We have a nice assortment of clay pots and saucers too. We started in January of this year gathering together our collection of containers, ornaments, ribbons, and gifts for the 2018 holiday season. Be sure to stop in regularly to see what’s new. If you missed the garden walk last Saturday on Getting your Garden Ready for Winter, read my article below for some important tips. I put a link to our handout on this subject in the article as well.